Soft silky and sumptuous this gorgeous organic cotton king sized fitted sheet from Natural Collection has a subtle stripe and lovely sheen making a truly special addition to our organic bedding range. Oxygen white - naturally whitened with no chlorine or optical brighteners. Dimensions: 152cm x 198cm. With 25cm fabric on each side to fit mattress with an approx depth of between 15cm and 18cm. The Natural Collection Organic Cotton King Fitted Sheet - White product ethics are indicated below. To learn more about these product ethics and to see related products, follow the links below. These sheets are lovely, generous size, soft and easy care. Pure cotton but without that coldness so often felt in other products. 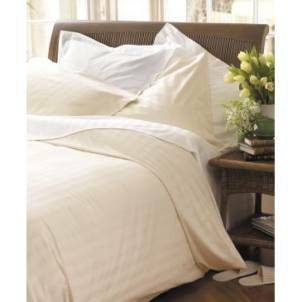 A: Hi, the thread count of these sheets is about 208 per inch. I hope this helps. Robyn.